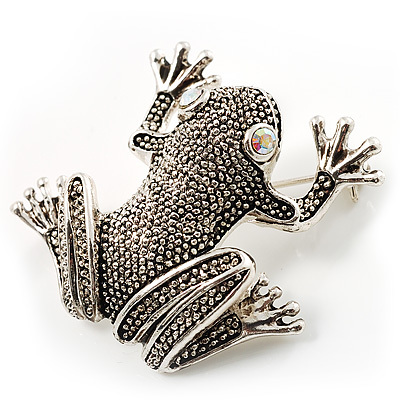 Put a little fun into your jewellery repertoire with this Marcasite Frog Brooch. Featuring a leaping frog design, crafted in antique silver finish, offering a vintage touch to the piece. The eyes are depicted with two clear crystals for a sparkling look. The brooch measures approximately 40mm x 40mm and fastens with a flag revolver pin. Looks great on pockets, lapels, hats, bags, shoes - or wherever.